Tartar sauce is a popular accompaniment to fish contains a number of vegetables and herbs, which are blended together with mayonnaise and then refrigerated. 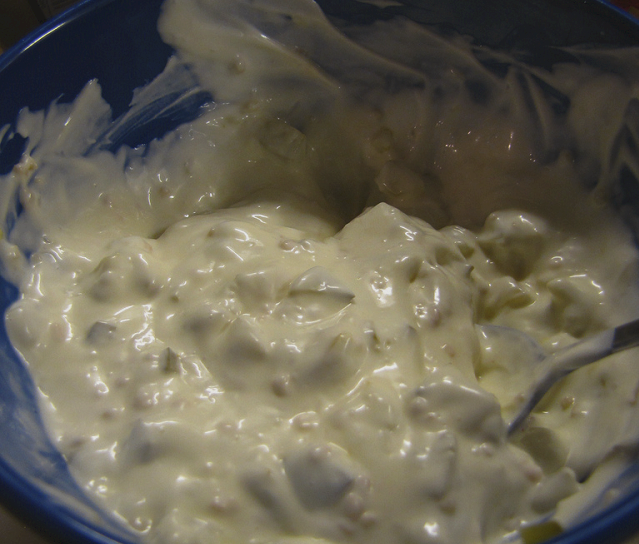 Transform your mayonnaise into a delicious tartar sauce. Combine the mayonnaise, relish and minced onion in a small mixing bowl, stirring thoroughly to mix the flavours well. Season with the salt and pepper and stir well. Cover the bowl with cling film and place Tartar Sauce in the refrigerator for a minimum of 1 hour before serving. Serve Tartar Sauce with deep-fried fish, seafood or fish cakes. great post! been looking for this recipe. Hi guys, no doubt that this is a simple dipping sauce for deep fried finger food! It is best prepared several hours before using it, but it can be used immediately. You can actually keep it for up to 3 days in the refrigerator.